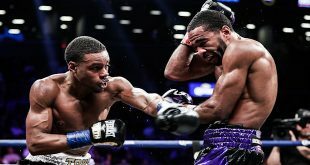 Promoter Rich Cappiello predicted that his prized fighter, Mike Oliver would "become a star on July 18th," and that's exactly what he did on Wednesday night, earning a lopsided unanimous decision over Cruz Carvajal, in their IBF super bantamweight title elimination bout. "Mike did exactly what we expected him to do," Cappiello stated. "There will be a world of opportunities in front of him now. He became that star." 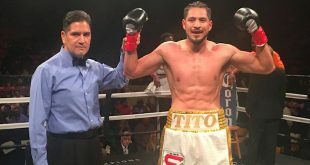 Oliver's lighting-quick hands, boxing skill, and effective counterpunching, all of which he has been finely tuning since first entering a boxing gym at the tender age of two, were simply to much for the 44-fight, 15-year veteran, Carbajal. "I was too fast," state an elated Oliver. "I was well prepared by Scully, and I felt very good tonight." Oliver's victory has now lined him up as the required mandatory defense for current IBF champ, Steve Molitor. While Molitor has a six month grace period, until he fights Oliver, Oliver plans on remaining active. "Hopefully, I'm going to talk with Cappiello, and try to get back in the ring in September, maybe in Hartford. When the title shot comes, I'll be ready, but I want to stay active." Judges at ringside scored the bout 118-110, 118-110, and 118-111. In his national television debut, undefeated featherweight prospect Dat "Dat Be Dat" Nguyen (11-0, 6 KOs) lived up to his billing, engaging in an action packed war with fellow stable mate, Castulo Gonzalez (9-3, 3 KOs). Gonzalez, representing Nguyen's most formidable opponent to date, lived up to all his pre-fight billing as well. 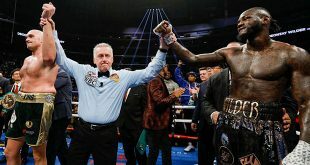 Neither of the two opted to take a step back, as they engaged in one brutal exchange after another, until the bell rand to end the 8-rounds of toe-to-toe action. "He was very tough," stated Nguyen. "I hurt him several times, but he just kept coming. I took some punches I didn't have to, but it's a lesson learned." Nguyen's trainer, the heralded Buddy McGirt, echoed Nguyen's opinion almost to a "T". "It's just another step in the learning experience. We'll get back in the gym and continue to improve." Nguyen stated he intends on resting his body and badly bruised right hand - which he says he injure early in the fight, then get right back in the gym. He is tentatively slated to be back in the ring in August, on a Telefutura boxing card to be held in Arizona.